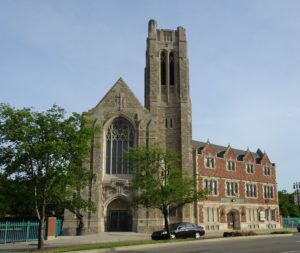 Historic Trinity Lutheran Church in downtown Detroit left most of our pilgrims speechless. 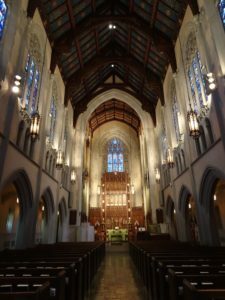 The magnificent 1928 Neo-Gothic structure is proportionally perfect and the iconography and decor on both the building’s exterior and interior is imbedded with deep theological and historical significance. 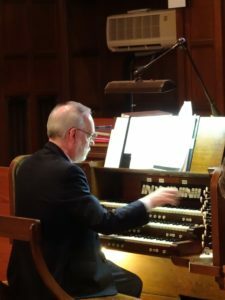 Everything from the floor tiles, many with beautiful symbols of the faith, to the rich blues of the stained glass by Philadelphia’s Willet Studios, to the acoustic of the Nave with the historic Skinner organ, considered by many to be the finest pipe organs ever built, was imbued with beauty. All about were wood carvings and murals and everything seemingly perfect. 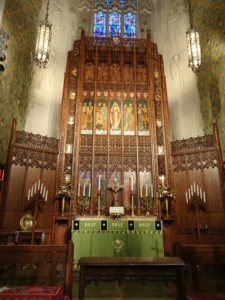 While nothing should be overlooked, including the carvings in the Narthex and even the pastor’s study, it was the Altar Reredos that spoke to many of us. The pastor, The Rev. 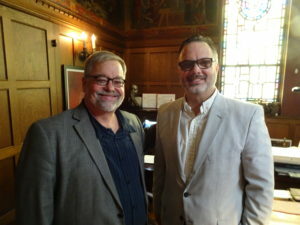 Darryl Lee Andrzejewsk, whose name is less German than the church’s history, took the time to explain the significance of the paintings, carvings and symbols in the reredos and as he did, it was almost as if he were singing. For Holy Trinity’s reredos is an artistic illustration of the Te Deum one of the Christianity’s most ancient hymns of praise. 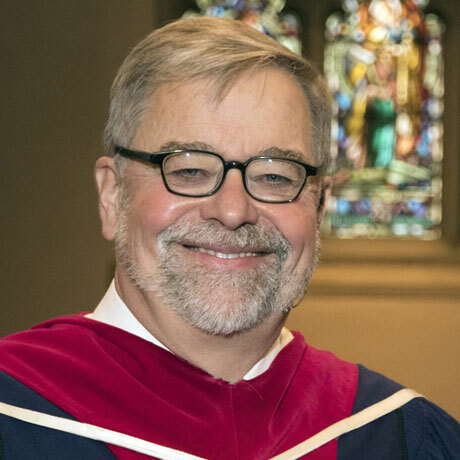 The Te Deum offers praise to God and acknowledges God to be the Lord of all. It brings together in praise the voices of the Angels crying aloud with Cherubim and Seraphim and all of Heaven. It reminds us too of the company of the Apostles, the goodly fellowship of the Prophets, the noble army of the Martyrs and the church throughout all the ages. And they are all represented in Holy Trinity’s reredos screen. My first contact with the church was Tammy Eberhard, a Canadian who for years crossed the border every Sunday to attend the church that had become her home. In more recent years, she and her husband have moved to Detroit where she now serves on the church staff. I wondered why someone would cross the border to go to church, but that was before I had been to Historic Trinity Lutheran Church. No longer do I wonder. 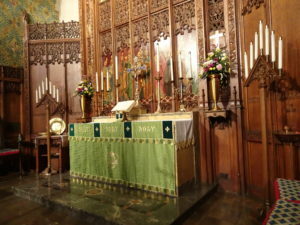 A visit to Holy Trinity is a glimpse into heaven, but then again that is what every church whether beautifully designed or stark and bare, should be like every Sunday. Because when we gather to give praise to God we are surrounded by the great company of saints and the angelic hosts. And the setbacks of this life and locale are replaced with visions of God’s Kingdom come and God’s will being done on earth as it is in heaven.